True! Thanks, Ifeel underprepared, but very excited! This book sounds adorable! Have fun at your conference :). Too bad for me I didn’t do much drifting this summer,; I envy Mac! The colors are really lovely too, Catherine! How cute is that? 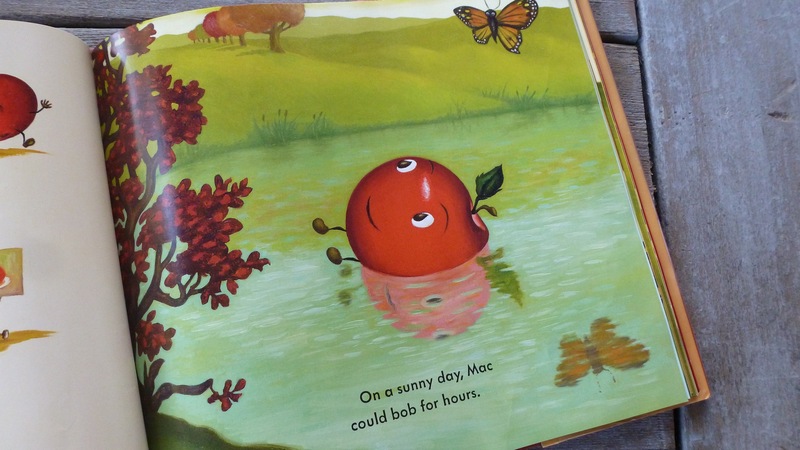 Love the sweet illo of the bobbing. Perfect picture book to share at the beginning of the Fall season. Enjoy your conference, Julie! Yes – perfect timing, Jarm. What a great choice with apples coming into season. Love the message in this book. I want to get it for my granddaughter. Have fun at your conference — lucky you get to meet Michael Garland in person. I review a lot of his books. Love his illustrations! I hope you two like it very much! Ach, I’m sure you will! Ha! This sounds like a unique way to cover bullying/name calling. My son will be so excited! Lovely review. I have never liked apples with worms, but I have changed the way I feel about them thanks to this review. I also need to get a hold of this book. It looks adorable and carries a grand statement for kids. Haha! Glad the book could turn you ’round! Wouldn’t you know, we have clouds today too. But I am grateful for the rain, oddly enough. This looks so a-peeling. I must bob through the bookstore to find this one! I see you, Cathy – bob, bob, bobbing along! Love your creative comments! Julie, your beautiful review made my day! Thank you for sharing! It was my great pleasure reading it. Mac is now one of my new favorite characters. Best of luck with it! I really enjoyed this book. It was featured on We Give Books online. And it’s cool the author is related to THE popular Hemingway. This really looks sweet (no pun intended)! 🙂 Hope you’re having a great time at the conference! Just seeing the title and the cover picture makes me want to read it! Sounds like a fun book. This book seems to be very popular. I read it with some kids who really liked it. It has a good storyline. But I have to say that it gives me the creeps. The worm is coming out of Apple’s head! That’s just a bad thought to me. Must be the shots dogs get for worms!